The Ukrainian president has urged NATO to deploy naval ships to the Sea of Azov amid a standoff with Russia. President Petro Poroshenko made the call in an interview with the German daily Bild published Thursday, saying that "Germany is one of our closest allies and we hope that states within NATO are now ready to relocate naval ships to the Sea of Azov in order to assist Ukraine and provide security." In Sunday's confrontation, the Russian coast guard fired on and seized three Ukrainian vessels and their crews that sought to pass from the Black Sea into the Sea of Azov through the Kerch Strait, between Russia's mainland and the Crimean Peninsula it annexed from Ukraine in 2014. There was no immediate reaction from German or NATO officials to Poroshenko's request. While NATO condemned the Russian action, the allies will be unlikely to heed Poroshenko's request, which could trigger a confrontation with Russia. A 2003 treaty between Russia and Ukraine stipulates that agreement from each of the two littoral countries is required for warships from any other country to enter the internal sea. 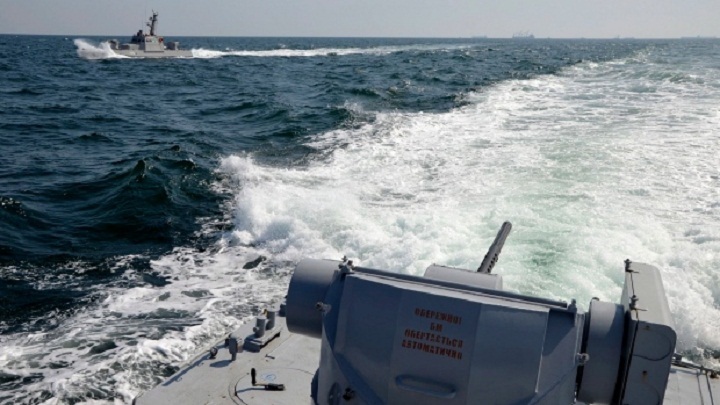 Ukraine has released what it said was the exact location where its ships were fired on by Russia, saying they were in international waters west of the Kerch Strait. Russia, meanwhile, insisted the Ukrainian vessels were in its territorial waters and refused to communicate with the Russian coast guard, or accept a Russian pilot to guide them through the narrow strait. "What were the border guards supposed to do?" Russian President Vladimir Putin said Wednesday. "They fulfilled their duty to protect the territorial integrity of the Russian Federation. If they had done something differently, they should have been put on trial for that." Poroshenko responded by ordering martial law in much of the country, a move that went into effect with parliamentary approval. Putin accused his Ukrainian counterpart of provoking the naval incident as a pretext to introduce martial law in a bid to shore up his sagging popularity and sideline competitors ahead of the March election. The incident marked the first overt collision between Russian and Ukrainian militaries since the 1991 collapse of the Soviet Union. It has fueled fears of a wider conflict and has drawn strong criticism of Russia from the U.S. and its allies. In the interview with Bild, Poroshenko lobbied the West for direct military support. "Russian President Putin wants nothing less but to occupy the sea," he said. "The only language he understands is the unity of the Western world." "The authorities in Kiev are successfully selling anti-Russian sentiments as they have nothing else left to sell," he said. "They can get away with whatever they do. If they want to eat babies for breakfast today, they will likely serve them too."